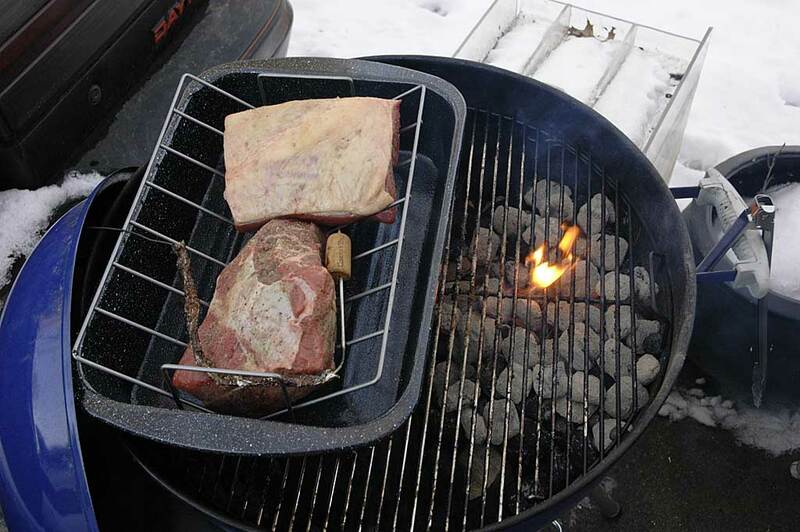 Its a nice enough day outside, its nearly 40, most of the snow is melting and there were some beef roasts on sale at the grocery store. I picked a bottom round and a rump. I usually use a chuck roast but thought I'd experiment. First I've dressed the roasts up with some olive oil, salt, pepper, and a bit of garlic and onion powders. 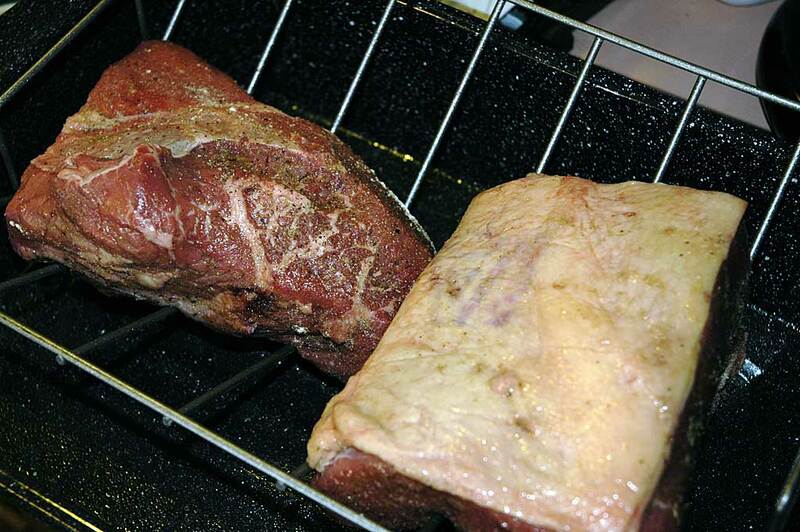 They then go on a roast holder and into a pan. I haven't decided what the end product from today will be yet, but I want to try to catch the drippings just in case. We'll leave these out on the counter to warm up while the grill is fired up. Now its time to fire up the grill. 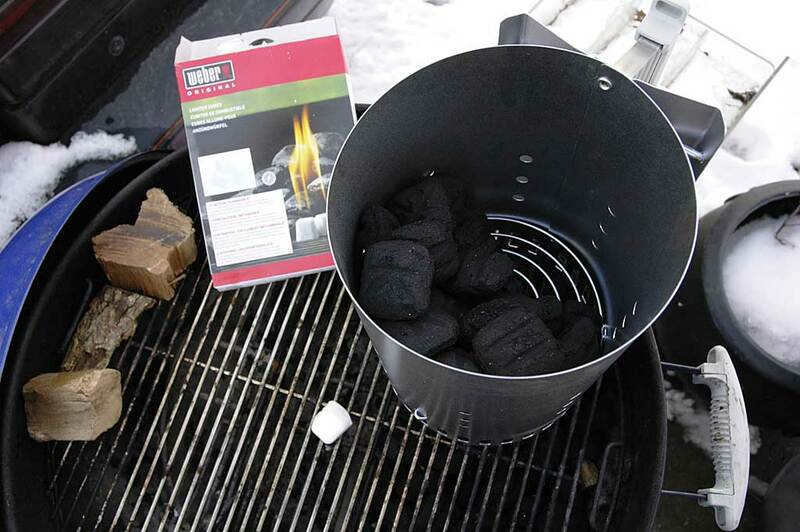 Weber's starter cubes and a chimney make it easy. You'll see a few pieces of hickory I've laid out off to the side too. And now the cube is lit, the chimney is on top and the waiting begins. 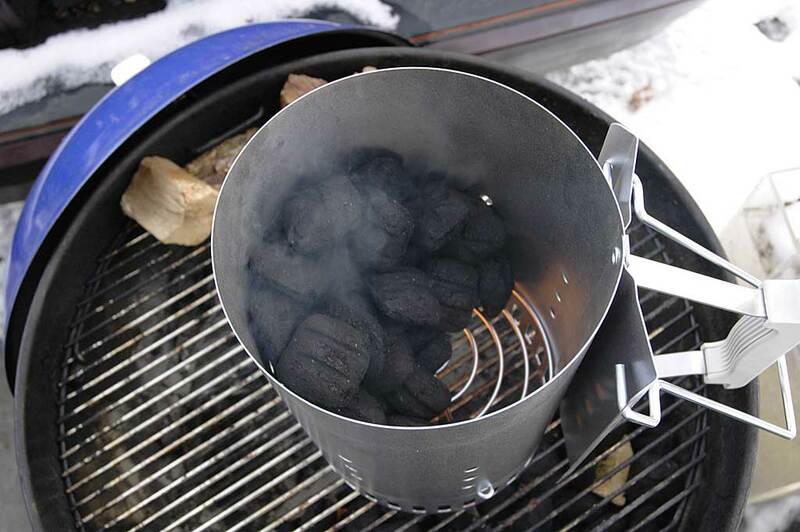 There's about 50 coals in there right now. You'll see why soon. We'll check on it in 20-30 minutes. Fire's hot and ready to go. I'm going to use the "minion method" for managing my fire. 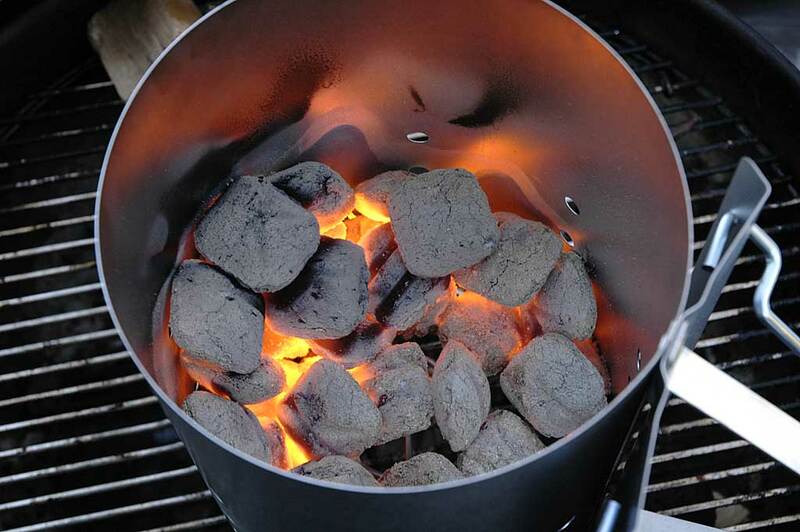 With it you put down a bed of unlit charcoal and wood chunks and then add your lit coals on top of it. 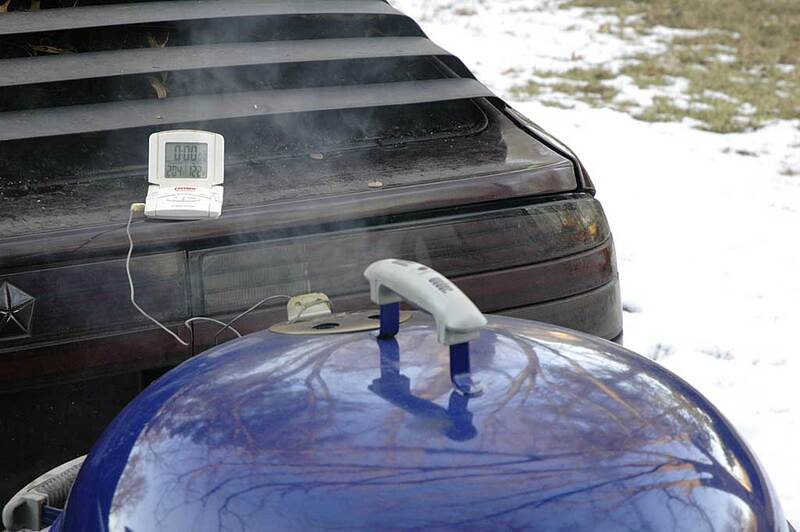 Run the grill with the top vent open 100% all the time. You'll use the bottom vents to control the temperature. 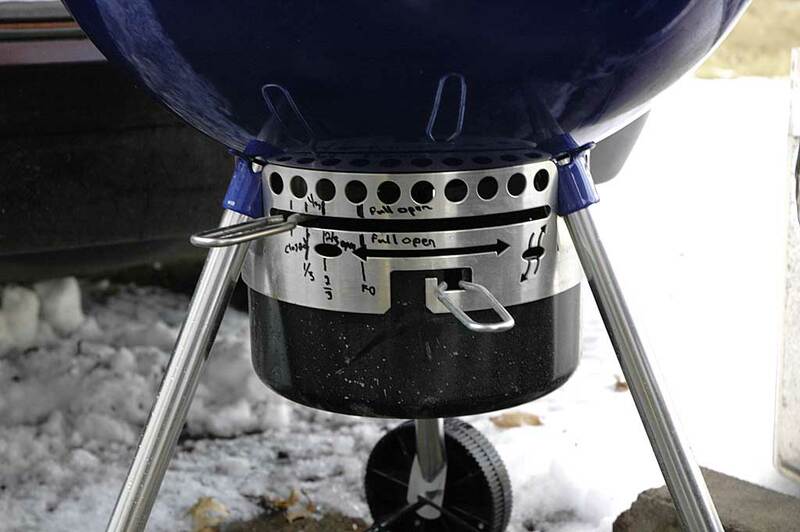 Open them up to raise the grill temperature and then shut them down as you start to get near your desired temperature. I'm going for 250 or so for this. 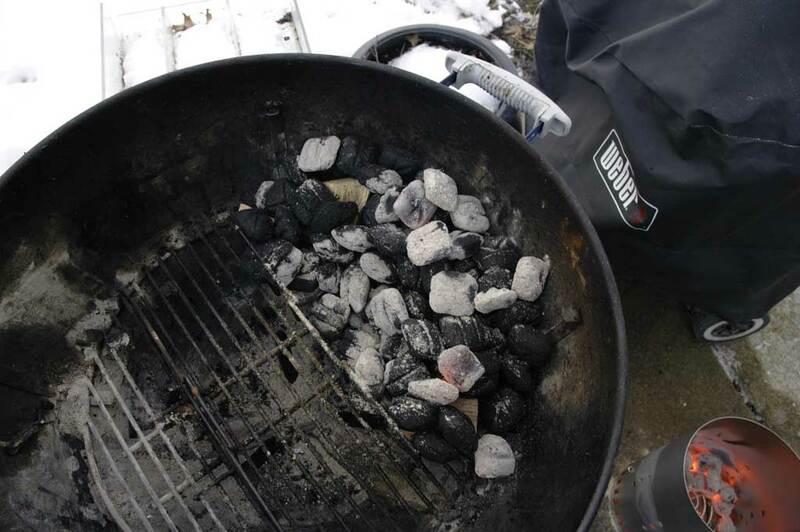 It'll take some practice to figure out how many lit coals are right for your cooker and the weather. 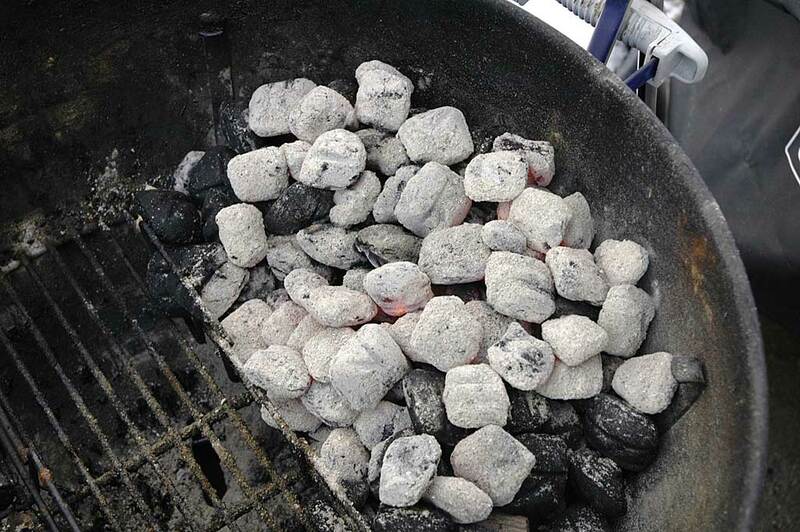 Here's my unlit coals. Then the lit go on top. The meat and pan go in off to the side. Notice my thermometer probe sitting in the basket too. Its shoved through a cork to keep it from falling through the grill grates. Add wood chunks and close it up. We're looking for a thin blue smoke. It appears as though my rump roast was far more tender at 130 than my bottom round so I went on and pulled it off, rested it, and sliced it to make roast beef. 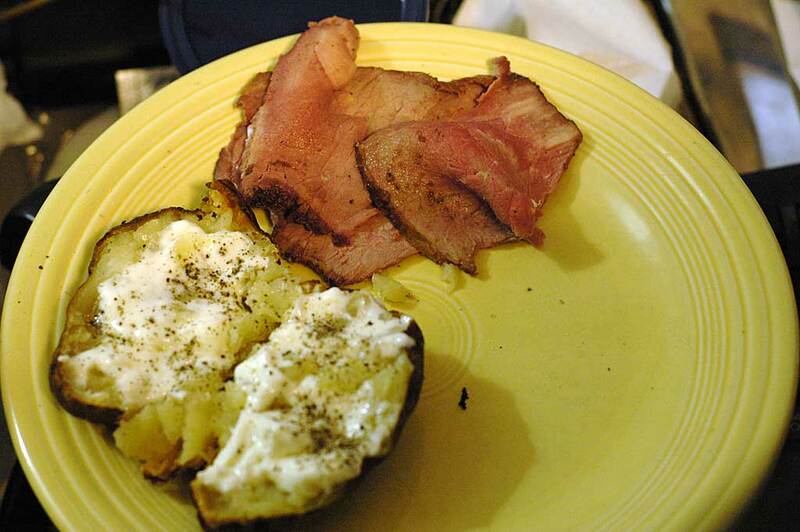 No time to make a full dinner, but I couldn't leave without having a little meal from the roast beef. 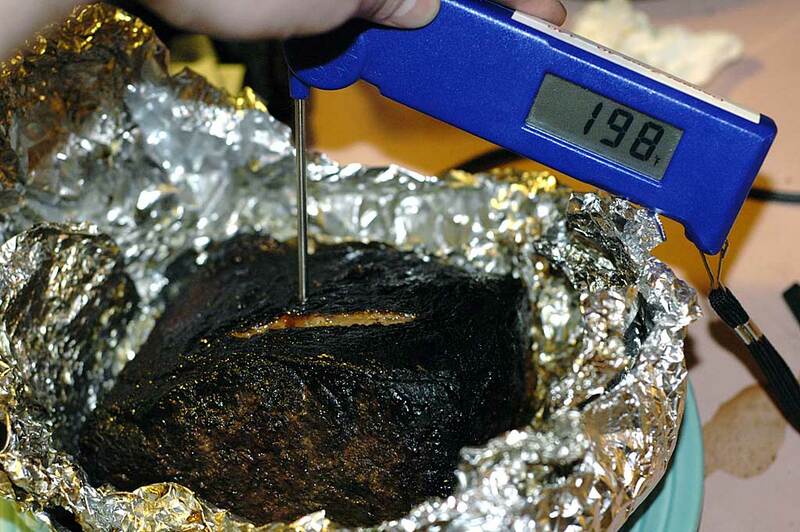 We'll take the other roast to near 200-205 degrees to make pulled beef. You'll generally notice a big difference in the flavor. 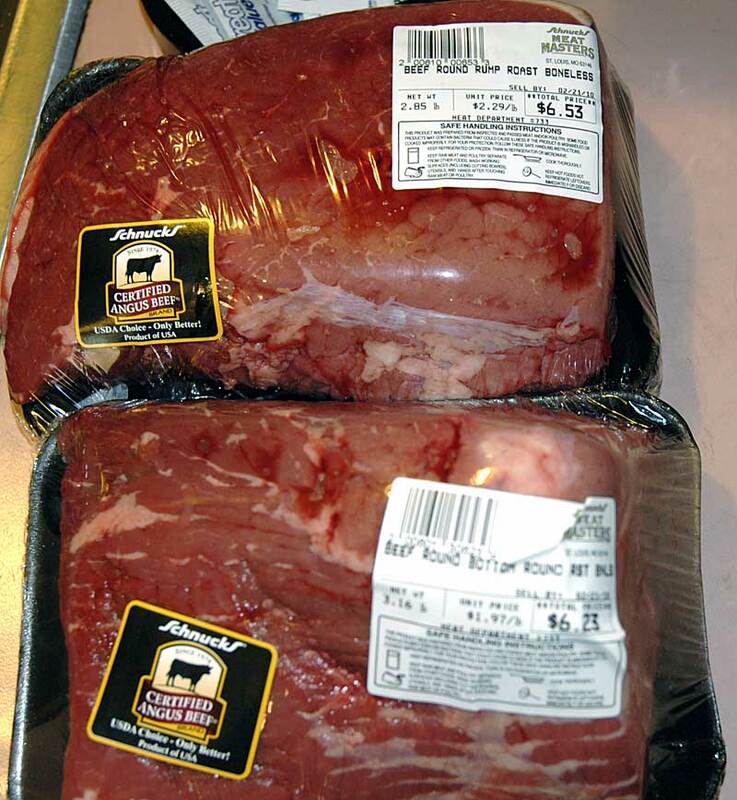 I think the meat that stops at 130-135 reminds me more of steak and taken to 200 it reminds me more of a roast. 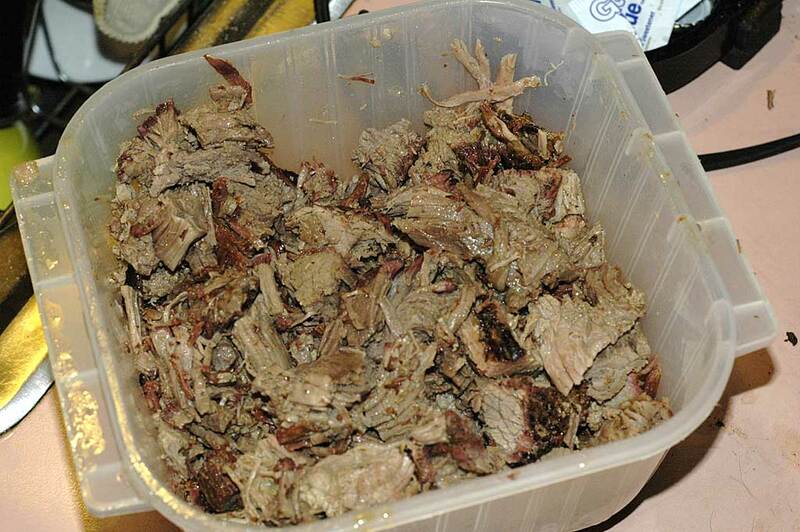 All shredded and ready for the fridge.